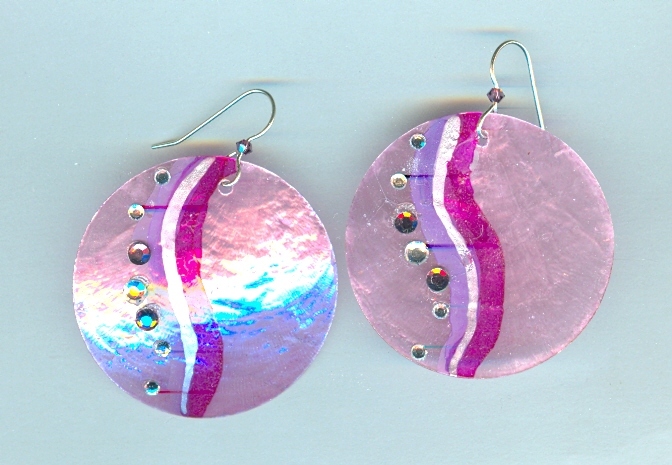 Misty lavender 45mm (about 1-3/4 inch) diameter capiz shell discs make a delightful back drop for the silver, orchid and fuchsia swirls hand-painted down their fronts. The watercolour design is blinged up a bit by a band of Swarovski clear and amethyst crystals that hug the swirl's contours. The earrings are suspended from sterling silver French hook findings embellished with an jet black 3mm Swarovski crystal bead. Super-sized, light weight, gorgeous and affordable: looks like SPARKLE PLENTY has done it again. Here's a hand beaded pin that's perfect for spring.